We have carved a niche amongst the most dominant names in this domain, instrumental in providing an excellent quality range of Masala Dosa. Store In Cool & dry Place Keep Away from Direct Sun Light. For Better Taste & Crispness: Microwave Dosa Only (Without The Plastic box) For 60 Seconds. 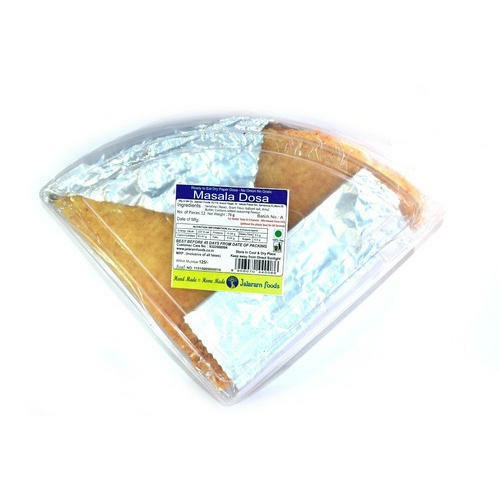 Established in the year 2011 at Mumbai, Maharashtra , we “Jalaram Foods” are a Sole Proprietorship based firm, engaged as the foremost Manufacturer of Ice Halwa, Handmade Khakhra, Handmade Thepla, Nachni Chips and many more. Our products are high in demand due to their premium quality and affordable prices. Furthermore, we ensure to timely deliver these products to our clients, through this we have gained a huge clients base in the market.